CVNL’s annual Heart of Marin Awards honor outstanding Marin nonprofits and the committed individuals who serve them. It is the largest event of its kind — where more 800 people come together to show their appreciation for nominees and award-winners. One of the eight nomination categories is Youth Volunteer of the Year. Up to five exceptional youth are recognized and awarded $1,000 each for their work serving a Marin nonprofit, education or faith-based organization. Our club president, Sylan Yuan (Zilan Yuan), was the winner of the Youth Volunteer of the Year Award this year! She was recognized for her work in the Canal Area through our club. She also decided to donate the $1,000 gift from the award to our club. Congratulations, Sylan! This past Tuesday, September 1, 2015, Children in Need had our first club meeting for the fall of 2015! We were happy to see some new faces in attendance. At the meeting we outlined our plans for this year including our quickly approaching trip to Stanford University with students from the Canal District. We also discussed our ongoing endeavors in the Canal including tutoring in English, Math, and Science for middle school students after school on Tuesdays as well as our involvement in the Kids Club on Friday afternoons. We are all really looking forward to a great 2015-2016 year for the Children in Need Club! Members of Children In Need Club and some students from Stanford University had the privilege of attending a private Children in Need workshop at Google on April 15, 2014. CiN would like to thank Mark Louie and Angela Mecca for hosting this informative and educational workshop! CiN would also like to thank a guest speaker, Shenaz Zack for introducing Google+. The word that appears in my mind when I think about our workshop at Google is “inspiration.” During the workshop, I realized that seemingly impossible things could be made possible with the right mindset. As a part of the workshop, all of us were separated into three groups to solve different scenarios. My group needed to find a way to get an A in an online class in which all of the students and the professor spoke different languages. In addition, the professor was located in a time zone five hours before us. As soon as this scenario appeared, I realized that it shared a similar problem to one that the Children in Need Club has experienced with our e-tutoring program. We had previously developed the idea of doing e-tutoring as a way to staying connected with the children we served during our summer projects, but gave up because the time difference made things too complicated. However, during the workshop, we solved our task by discovering and utilizing applications like Google docs, Vocre, World Lens and Google hangouts. Our team activity gave me a lot of new ideas that can be applied to the e-tutoring program. Just like the concept of a “10X Project” that was introduced during the workshop, the e-tutoring project no longer seems impossible for us. In fact, we have decided to start working on it! Furthermore, the workshop has inspired me to pursue dreams in other parts of my life that I previously did not have the courage to believe in. Overall, the experience taught me that dreaming big is a necessary and valuable step in becoming the person I want to be. On April 15th, 2014, I went to Google headquarters in Mountain View, California, to attend a workshop about Google+ with several other members of the Children in Need Club. The workshop started with a short presentation, which showed us interesting features of Google+ and explaining how Google helps better education in schools all over the world. We were then divided into three groups to explore how technology can help solve different real life scenarios, and then gave presentations on our findings. For our group, a college bound student needed to find an apartment for rent that was close to campus. The student's challenges were that he had never been to the city where college was located and had never met his roommate before. So basically, our student needed to find a way to contact his roommate and then find a good apartment. Our group's solution was for the student to use social networking to contact his roommate and then ask current students about good locations for renting an apartment. After the team projects we had a very nice lunch, and then we had a short, very fun tour of the Google campus. Overall, I found the experience to be very fun and educating. My experience at Google today was totally eye-opening. I am very grateful to have been given this rare opportunity to tour the headquarters of one of the most successful technology companies in the world! I am very surprised by how much the company trusts it’s employees to work diligently, and that they offer so many leisure and activity facilities as rewards. I totally agree with the concept of a less stressful working environment. I was also pleasantly surprised by Google's work modus operandi, which is summarized by their concept of “10x thinking”. It provides the opportunity for everyone to solve problems by thinking outside the box instead of following the steps created by others. Although I do not have any interest in working in the technology field, this workshop showed me that Google is much more than a programming company. Google is centered around the idea of making communication easier and living with an unlimited imagination. As a high school student, it was such an honor to be invited to visit the Google campus and experience a workshop with Google’s employees. Mr. Mark Louie was our tour guide and arranged our day. The presentation that Mr. Louie gave reminded me of my experiences using Google map as a tour guide when I visited colleges in unfamiliar cities, as I relied on it to help me find the schools, hotels, and bus stops. I realized how important and useful many Google products are. I was also amazed by the Google Glasses Mr. Louie wore. They are as convenient as normal glasses but can also record sound, take videos, take photos, and more; with all of these functions controlled by voice. They are like your electronic eyes that record everything you want. An idea I suggested was that they could be designed for musicians who struggle to turn the pages of their music while playing. I thought that the Google Glasses could be modified to follow along as the musician played, and show the music, so that it would show the next page automatically in the Glasses for musician as s/he preformed. It would be a very thoughtful product for musicians because we have longed for such a technology that could make our performances more convenient and pleasurable. I will be the first purchaser on the day it comes out! The workshop at Google helped me to develop tactics to combat some technological problems I was experiencing with my schoolwork. I can now say that I am a huge fan of the Google for education apps I have started using since being introduced to them during our workshop. Further, as a project leader for the Children in Need Club, I learned new methods of connecting with club members and supporters through the Children in Need Google+ page. I have also been inspired to create a page for the group that I am traveling with this summer to teach at a summer school in Bosnia and Herzegovina. I am very grateful to Mark Louie, Angela Mecca and Shenaz Zack for teaching us all that Google has to offer to aid us in our goals as aspiring global leaders. It was really cool to personally learn about the employee culture from our hosts and see that, for all of the success and drive that the company has, it also has a lot of fun and personality. We saw all sorts of amazing things on our trip, including slides (yes, slides), playful decorations, interesting modern architecture, and lots and lots of food. I was surprised when I learned that the CEO's come and visit all the dining halls once a week to give speeches to their employees about recent progress and accomplishments. Overall, the tour showed us how much Google values out of the box thinking, integrity, and imagination in their identity as a company. I found this personal approach to business in the traditionally stark corporate world to be very refreshing and inspiring. The trip was a reminder that a work environment, be it school, a job, or the "grown up" world, depends on your attitude. I feel so lucky to be one of the members of Children in Need club that attended our recent workshop at Google. There, Shenaz Zack introduced us to Google+, and showed how useful it can be in one's daily life. Her presentation showed us how we can make our Google experience better by arranging different social circles on Google+. We also learned about many other Google products that can help better education, work productivity and quality of life. To me, the most impressive part of the presentation was learning about Project Loon, one of Google’s 10x projects. The mission of Project Loon is to provide Internet access to rural and remote areas using balloons. This project showed me that Google is not a regular technology company, it is unique in it's devotion to developing technology for the sake of changing world and improving lives. Project Loon makes me as member of Children in Need club very excited. Since our club’s goal is to help the children all around the world I think that this project could be valuable in helping us to spread our work to people in rural areas. When I was doing volunteer work in rural areas in China, I found that the educational resources are allocated unevenly. Children who live in rural areas do not have the same opportunities to a good education. Project Loon could provide them with the Internet, and thus resources for a good education such as online courses and information. Although the Children in Need club is a youth club with limited power, we are truly devoted to changing the lives of children in need all over the world. The workshop in Google made me realize that technology empowers people and will help make our club’s dreams come true. In attending the Google workshop on Tuesday, I learned several intriguing things and rekindled my love for the company itself. I love the freedom that Google gives to its employees. If you have a passion for something, you will most likely find a place here. Sure, many workers studied business and marketing in college, but many studied other majors, such as history and political science. It’s interesting to see how Google incorporates all of these people’s passions and talents into one cohesive whole. The campus itself is also quite incredible. Google provides so many luxuries to its employees, proving that it does care about the wellbeing of its workers. There are massage rooms that give you a free massage on your birthday. There are microkitchens on every floor for workers to make coffee and grab a snack. There is a sand volleyball court outside. There are also nine gyms on campus solely for "Googlers". There are plants all over the place indoors with placards that say, “To improve air quality.” There are gardens and hot tubs. There is a cafe that allows workers to bring their dogs to work with them. Google is also very lenient with its scheduling. As long as an employee works diligently, their hours are fairly lax. Google has a very friendly and caring environment, so I understand how the people we met really love their jobs.Though it is a relatively new company, Google has definitely made a name for itself both in the way it treats its employees and in its creative ideas. This Tuesday I went to a Google workshop that was organized by the Children in Need club. First we went to a meeting room, where employees from Google plus gave us a presentation about how Google+ works. After that, we learned about “10X”, a program that seeks to turn impossible ideas into reality. Google glass is a brainchild of this program. Another interesting thing I learned from their staff is that employees get 20% of their working time to work on the projects that really interest them, which is called Innovation Time Off. Later we broke up into three groups, and each group was given a situation to solve. Many of us solved ours by searching on the internet to find google apps, thus further realizing how useful their products really are. After, we had lunch with lots of the Google staff before receiving a tour of the googleplex, which finished in front of the creatively decorated Android building. I visited Google today and had a lot fun. We first introduced ourselves and each thought of one problem that we would like to solve in today's world. Then Angela Mecca introduced to us to a great project that Google is currently working on called project Loon, which could potentially give WiFi to the world. It is great because if completed, everyone in the world could have access to the internet. We then listened to a presentation on ten ways that Google plus can be used to make our lives more convenient. It was really helpful since I had little knowledge of Google plus beforehand. After that we were divided into three groups to deal with different hypothetical situations. In my group, our situation was that we were students taking an online class in which our classmates were from different countries and spoke different languages. The problem we faced was how to tear down the class language barrier using technology. We used Google to find two really cool apps called world lens and Vocre. World lens helps to translate written words in pictures from one language into another. Also, Vocre takes and translates recorded speech while simultaneously enabling a video chat, which I found to be pretty cool. We found that we could also use Google plus to share live videos so that everyone could be included in the class. For homework we decided to use Google docs to share files and enable our professor to give easy feedback. The other two groups also presented their ideas based on their situations. Later in our the day we visited parts of Google's beautiful and expansive campus. I was particularly shocked by how good their facilities are and by the positive, relaxed attitude Google employees radiate. I would like to thank Mark Louie and Angela Mecca for taking us around Google and giving me insight on how technology can greatly influence education. Yesterday, Children in Need Club members attended a workshop at Google to learn how to further our mission to help children in need around the world. The moment we arrived, we were surprised by the relaxing atmosphere outside the building and even saw people playing beach volleyball in the courtyard. I couldn't help but contemplate on what the day to day lives of their employees must be like. This initial reaction made me instantly excited to explore and learn more about Google. We were then taken to a multifunctional room and given a presentation on Google plus, which we learned can be used to connect us with people thousands of miles away. We also learned that Google is great for organizing friends circle and so on. The questions our aspiring world leaders asked prompted fun conversation, and we laughed and enjoyed our time until noon. At lunch, we experienced a taste of what it's like to work in Google by eating in the cafeteria. With so many types of food to choose from, I believe we all ate very well. Thank you Sasha Nakae, our editor, for helping us edit the reports! Our club had successfully held the first meeting of the year 2014 on January 16. Together with the new and old members, we have more than 40 students attending. We are surprised by the amount of new members who are interested in joining our club. We started the meeting by introducing our new Club President, Jaqueline Liang, and new Club Officers, Linda Li, Susan Sun, Ivy Liang, Clair Hu and Jo Griffin. They each introduced their jobs and talked about projects that they are leading. They are also recruiting members to join as committees for projects that we are doing this year, such as volunteering in Beijing for autistic children and another to Cambodia during the summer. There are also currently occurring projects such as tutoring in nearby schools on Tuesday and Friday after school everyweek. A lot are interested and signed up to take part in the committees. For those who did not attend the meeting or did not signed up for any projects, we encourage you to contact any of our officers and take part in our projects. This year, in order to encourage our members’ participation, we are creating a member participation chart and mark activity attendance of members’ in our club. We would give prices for those who have outstanding attendance to our projects and meetings every month. 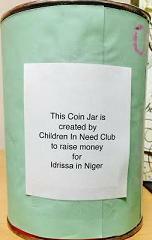 We are putting out a coin jar in the high school office to raise money for our club’s sponsored child, Idrissa. Idrissa is from Niger, Africa, the poorest country in the world. Our club has been sponsoring him since he was 4 years old. His ambition is to be a teacher when he grows up. We are planning to support him until he turns 18. 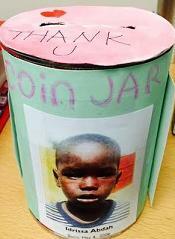 Please bring your changes and spare coins to help Idrissa in continuing his education. We hope that this coming year of 2014 will be a fruitful and meaningful year with our new officers and enthusiastic members! How are you? I am the current president of Children in Need Club, which started sponsoring you three years ago, when you were 4 years old. From your recent progress report, we know that you are in school now. We are happy for you, and hope that you enjoy your classes and do well in school. 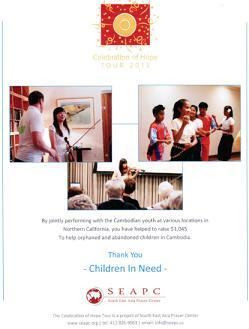 We are a student club comprised of 70 musicians and volunteers. We often raise money through concerts and bake sales. 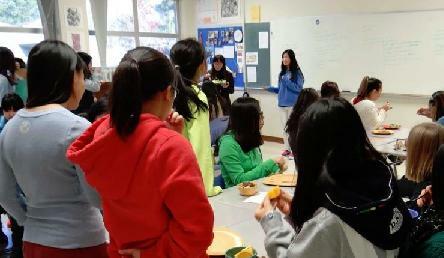 Recently, we held a bake sale at a high school near San Francisco, and raised money for your next 6-month sponsorship. 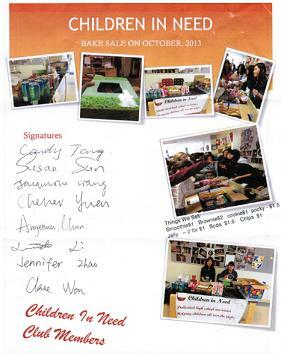 Attached you will find the flyer with photos from bake sale in addition to notes from your sponsors. We are your big “sisters” and “brothers” in the United States. We will keep on sponsoring you when we can. Please write us and send us photos whenever you can because we enjoy reading your story of growing up. Recently we received an appreciation letter and a certificate from SEAPC to thank our club for performing with the Cambodian Dance Group in the Celebration of Hope Tour concert series around the bay area. The letter indicates that nearly fifty new orphaned or abandoned children in Cambodia have a home and sponsorship since the tour began. We are happy to be able to help.